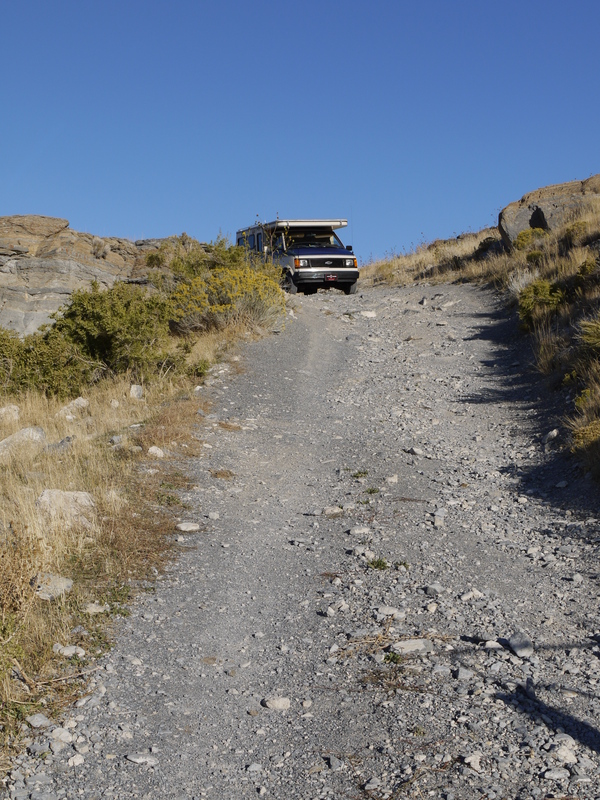 Let’s take a day trip from Salt Lake City and visit some of the sites of the 1913 route and the 1919 shortcut. The circle route we’ll take goes west from S.L.C. to Benson’s Mill, then to Granstville, around Timpie Point and south into Skull Valley. There we will see Lone Rock, the Iosepa Cemetery, Brown’s Ranch, and Orr’s Ranch, all on the original 1913 route. 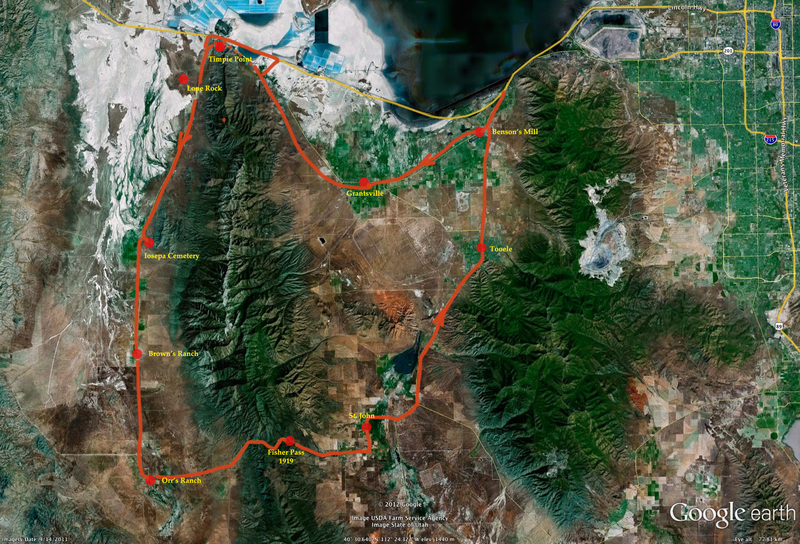 From Orr’s Ranch we’ll turn east over Fisher’s Pass (1919) and down into Rush Valley to St. Johns and return via Tooele. I covered Benson’s Mill and Grantsville in a previous post. Now we head west out of Grantsville to Timpie Point. 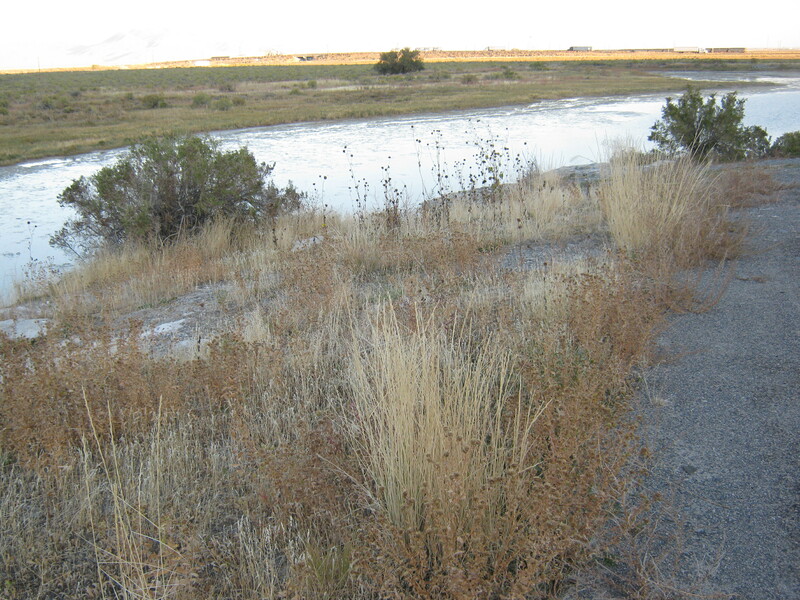 Having skirted the south end of the Great Salt Lake via Grantsville, it is necessary to round Timpie Point in order to gain access to Skull Valley. 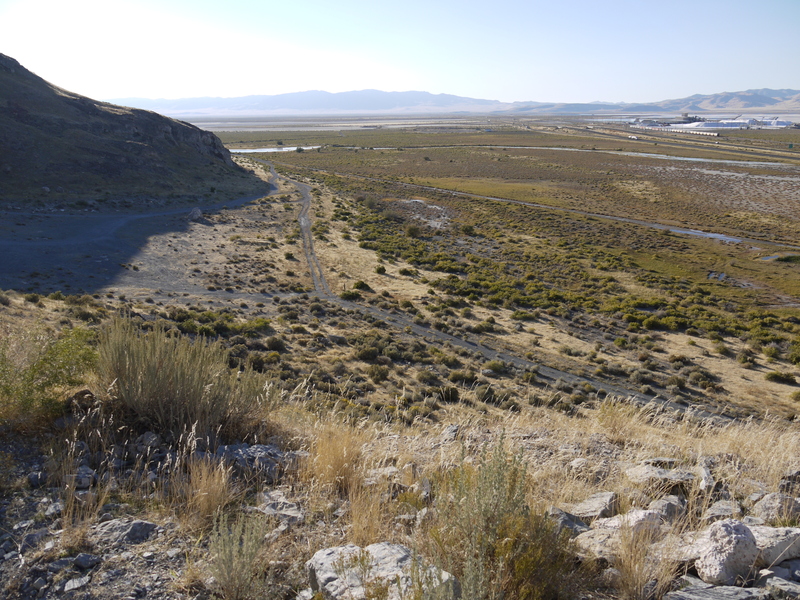 When U.S. 40 was widened into I-80, the old LHW was cut, so you may either take the Interstate for a couple of miles or embark on a mini adventure over the tip of the Stansbury Range. From Granstville proceed westward to the intersection on 138 here ( 40° 40.567’N 112° 33.052’W) and either turn left towards Timpie Point or turn right to the Interstate. On the road west towards Timpie, the LHW will be on your left roughly near the railroad track. The I-80 exit on the west is #77 – turn south then east to the base of the point. 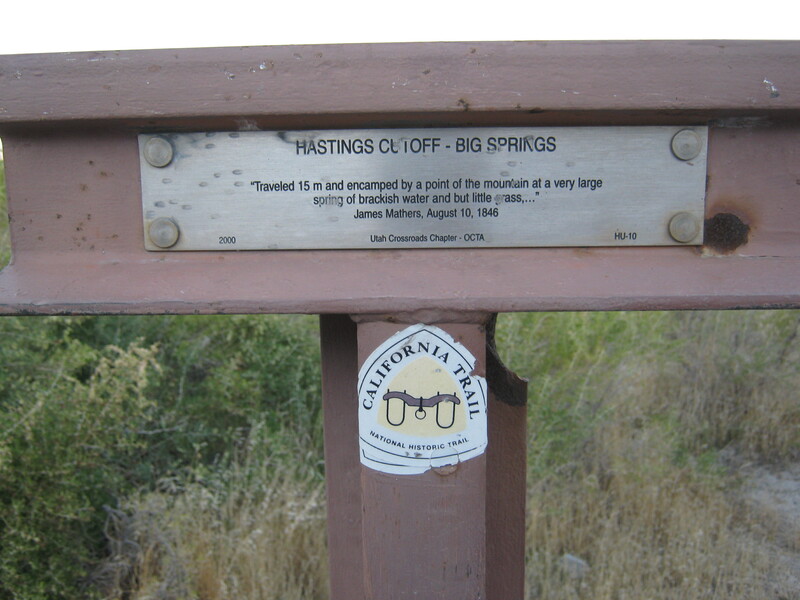 There are numerous concrete barriers that block your entry onto the old LHW going south, but at the base you will find a wonderful spring and marker. 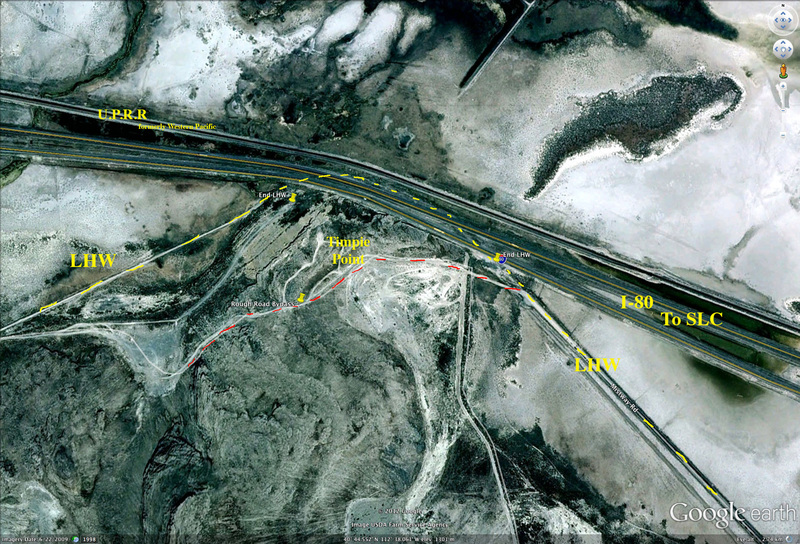 The end of the LHW at the interstate is found here ( 40° 44.628’N 112° 38.224’W). It’s annoying the other end of the LHW is within spitting distance and yet you can’t drive there. In the photo above, I believe the original Lincoln Highway is the straight line in the center that is showing some standing water. The large buildings in the background are at I-80 exit 77. The view is to the west. I’ve camped comfortably here at the base of the hill. If you are adventurous, you may forget the I-80 portion and head directly over the point. The east end is here (40° 44.560’N 112° 37.920’W) and the gravel road will be obvious; so will the old Lincoln Highway just to the south. I wouldn’t undertake this in a low sedan but I take my 2WD van on roads like this all the time. The west end of the bypass road is here ( 40° 44.468’N 112° 38.449’W). Now return to Skull Valley ( 40° 44.538’N 112° 39.235’W) and turn south. Coming up: Iosepa, Brown’s Ranch, and Orr’s Ranch. This entry was posted in Desert, Salt Lake Desert, Skull Valley, Utah and tagged Benson's Grist Mill, Day Trip, Ezra Taft Benson, Grantsville UT, Tooele, Utah. Bookmark the permalink.